6502/65C02 assembler and linker for the PC. It's 100% compatible with C64's TASS v5.1 and the most of its further releases, containing the whole lot of useful improvements like generating the listing file, including binaries, etc. Kick Assembler (written in Java language) is the combination of an assembler for doing 6510 machine code and a high level script language. Made mnemonic extensions to force all addressing modes. Corrected bug in error message when forcing an illegal addressing mode. Made .importonce directive to ensure libraries only gets included once. Corrected typo in error message. Thanks to Tlr for pointing this out. The default value for the source tab width is now taken from theinput file instead of being always nine (9). “–unnamed-hex” added; when specified TMPview will output hex notation instead of the default decimal for un-named bastext tokens. “–petscii-dec” and “–petscii-hex” added; when specified TMPview will output *all* PETSCII-only characters (those that cannot be displayed rationally in ASCII output) to bastext tokens in either decimal or hex notation rather than their named counterparts. “–byte-dec” and “–byte-hex” apply to single character literals. “–byte-columns” added; the given value sets how many values per line the “–byte-dec” and “–byte-hex” features output. “–stats-detail” and “–stats-wild” added to display interesting and extremely critical statistical output, respectively. “–screen” now regards values 0-63 as potential screencodes but only converts strings where every character qualifies. handle the fake ‘_’ character properly in quoted strings and macro bodies. .include filenames are now translated. TMPx (pronounced “TMP cross”) is the first and as yet the only cross assembler that is 100% compatible with the full syntax of Turbo Macro Pro (as well as the original Turbo Assembler Macro from which it is derived). 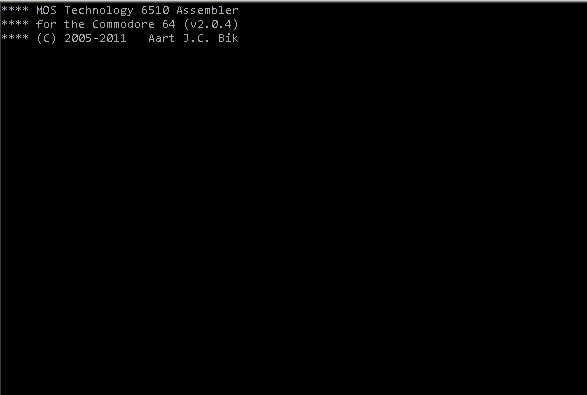 This 6510 assembler has been developed by Aart J.C. Bik. Win2c64 is a cross-assembler for the 65xx microprocessor family that runs on any Microsoft Windows platform and generates code that can be executed on the Commodore 64 or other 65xx-based microcomputer. Full docs are included in the archive as a PDF.